Math Puzzles is a unique Math puzzle game developed by applabs, your objective is to find patterns hidden in the puzzle and arrive at the solution. This game helps in enhancing your logical thinking, ovservation skills, mathematical knowledge, and out of the box thinking. The game features 75 challenging brain teasers, each brain teaser offers a different and unique challenge which forces the user to think in unconventional way. 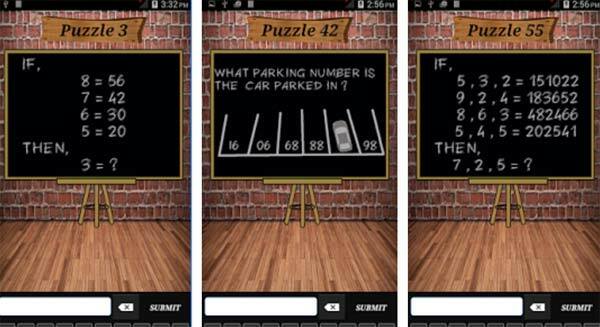 Some puzzles can be challenging, but we do not encourage you to watch the video walkthrough before you have a deep thinking since it is a math challenging app. If you get stuck in the game and you need to find the solution, check out the video walkthrough for the game. This entry was posted in Android Games, iOS Games, Mobile Games, Walkthrough and tagged Math Puzzles, Math Puzzles Answers, Math Puzzles App, Math Puzzles Cheats, Math Puzzles Help, Math Puzzles Hints, Math Puzzles Solutions, Math Puzzles Tutorials, Math Puzzles Walkthrough by Marvin. Bookmark the permalink.